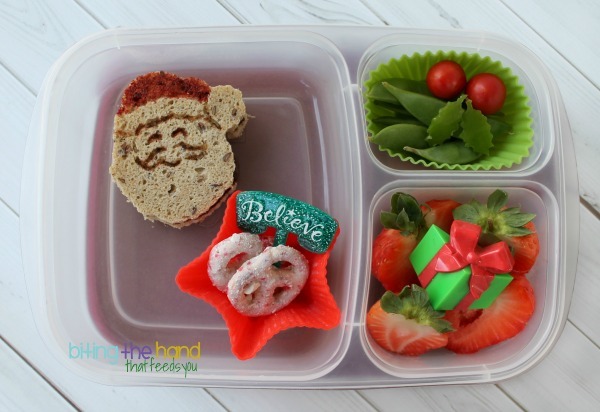 Bento Bloggers and Friends are doing a series of holiday-themed bento hops! 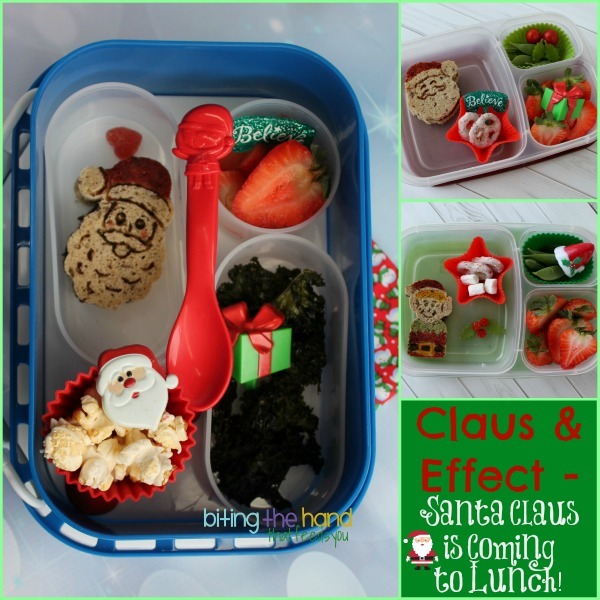 After you check out my lunches here, find the button at the bottom of this post to "hop" to the next lunch in "Santa Claus is Coming to Lunch!" 12/11/13 - Little E is really into some Santa movie on Netflix lately, so I made a Santa lunch for her using a Santa cookie stamp. I used a tiny holly leaf cutter on a sugar snap pea and used the cut-outs from both halves to pair with some small cherry tomatoes to make "holly" in her veggie compartment. I added a Christmas gift cupcake pick in with the strawberries and a "Believe" cupcake pick with the pretzels to keep with the seasonal theme. Santa is nothing without his elfin helpers, so Z got a sandwich made with an elf cookie stamp (Target exclusive, by Nordicware.) For both sandwiches, I used some India Tree natural food colors and a cheap paintbrush to color in some details. 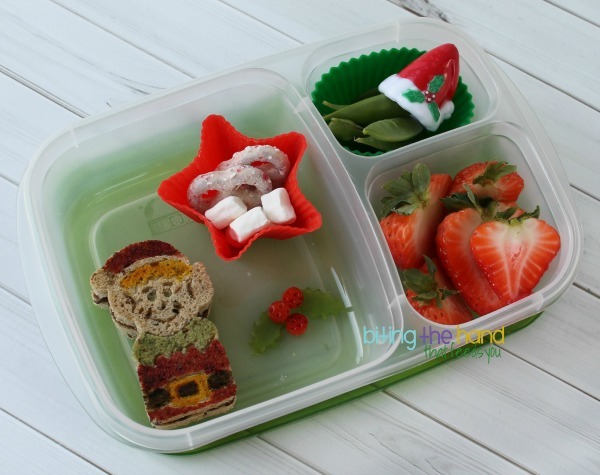 In addition to the Santa hat cupcake topper (found in a bake shop,) I used a few snap-pea holly leaves along with some straw-cut strawberry slice circles to fancy-up the rest of the lunch. Ho-ho-hope You Like Your Lunch! 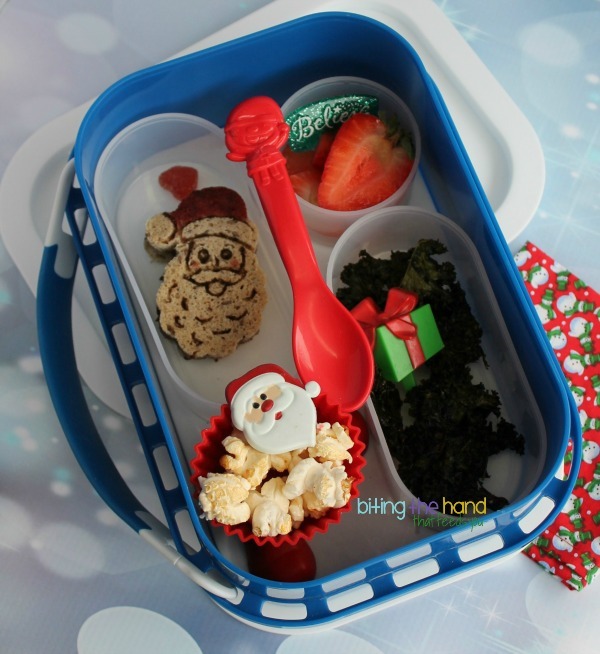 12/17/13 - I really wanted to use my Santa boot muffin cup, but it's too tall to fit in any of our lunch boxes... except the yubo! I chose the blue yubo because I couldn't find my green one! Doh! Blue is wintery though, right? The muffin cup replaced one of the small round containers, and I added in two medium oval inner containers instead of the sandwich-sized one that comes with the base box. A Santa face ring cupcake topper and the present and Believe cupcake picks keep the ho-ho-holiday spirit going, along with a red Santa spoon I got from Target last year. Or the year before... Yes, I know. Nothing in this lunch neeeeeded a spoon. Hush. It's adorable and Santa-y. 'Nuff said. I don't have any Santa ones, so I used a red and green snowman cloth napkin from Red Poppy Crafts on etsy folded over the popcorn to keep it in place in the box. Click the button below to check out the ho-ho-holiday inspiration Eclectic Lamb has come up with! Then keep ho-ho-hopping through to see all the Santa Claus creations! After you get back here, be sure to check out the Winter Wonderlunch, Season's Eatings, and Jolly Holiday hops too! Yummy lunches! I love the little holly detail and the sandwiches are perfect. I love your lunches and the details! I now need to find a tiny holly cutter. I love your elf! Such cute lunches. Awesome lunch!! Love all of them!! So colourful & fun, love them all!